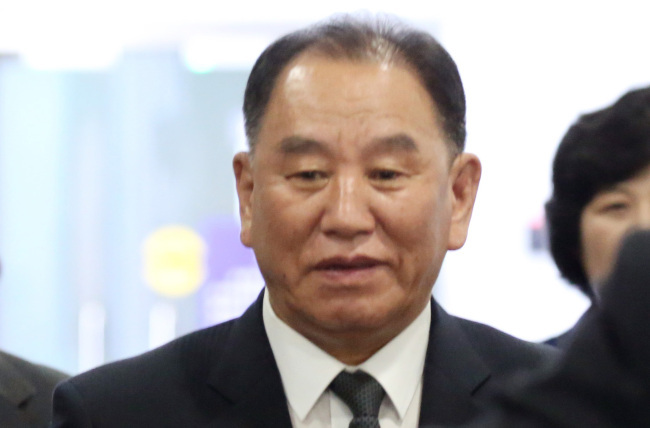 North Korea’s chief negotiator in US-North Korea talks, Kim Yong-chol, will head to Washington on Thursday, the Chinese Foreign Ministry confirmed Wednesday, sparking speculations a second US-North Korea summit may be imminent. According to the ministry, North Korean officials, including Kim, have booked tickets to Washington that depart from Beijing on Thursday. Kim is the vice chairman of the ruling Workers’ Party Central Committee and the chief negotiator in US-North Korea talks. North Korea’s Vice Foreign Minister Choi Sun-hee, who had reserved a seat on the flight to Washington, has reportedly confirmed a flight to Sweden. According to reports, the North Korean officials are booked on a United Airlines flight scheduled to depart at 6:25 p.m., Beijing time, on Thursday. Kim and the other officials are believed to have had reserved seats on Washington-bound flights on both Thursday and Friday, but confirmed their schedule early Wednesday. With Kim confirming his flight, speculations are rising that the North Korean official may meet with US Secretary of State Mike Pompeo to hammer out details concerning the US-North Korea summit. The reports from Beijing follow on the heels of a series of reports on US-North Korea developments. Earlier in the day, CNN reported that Kim is set to arrive in the US on Thursday and to spend at least two days in Washington, citing sources familiar with US-North Korea negotiations. CNN had also reported that a letter from US President Donald Trump had been delivered to North Korean leader Kim Jong-un. Earlier this month, Trump revealed that he received a “great letter” from Kim Jong-un, and reiterated his belief that North Korea is committed to change, stressing his role in related developments. While Trump has stated on a number of occasions that he plans to meet Kim Jong-un for a second time, the time and place remain undecided. North Korean leader Kim also met with Chinese President Xi Jinping earlier this month, which has been interpreted in South Korea that the North’s leader is preparing for his meeting with Trump. In his New Year’s press conference on Jan. 10, President Moon Jae-in said that Kim’s China visit hints at a US-North Korea summit, which he hopes will mark a major turning point for issues surrounding North Korea.